I believe in the power of a single book. That one story, or character, can empower/challenge/save a life. I’ve seen it with my own eyes. In 2016 I was asked to join the Scholastic Principal Advisory Board. This isn’t a position I get paid for but instead is somewhere that I can grow myself as a learner and be part of reading conversations with Scholastic. The last two years that I’ve been on the board have been fantastic. 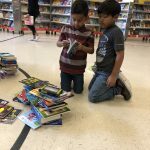 I have learned so much about “summer slide” (the loss of learning during the summer), the importance of even the presence of books in the home, independent reading practices, increasing book fair involvement, and so much more. 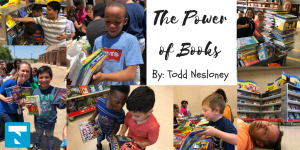 While sitting at the annual Scholastic Principal Advisory Board meeting in February, we were discussing the importance of putting books in the hands of children and how important it was that we encourage them to read over the summer. 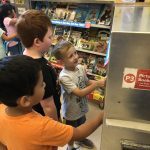 I learned about a great Summer Reading Challenge that Scholastic puts on. I remember right away making excuses of why my students wouldn’t participate (yes, even I still find myself making excuses sometimes). I tried to blame funding or lack of internet access. 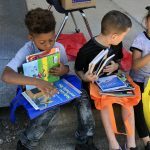 But while sitting next to me, Mary Beth Coleman helped eliminate all my excuses and show that other schools, with just as high of a poverty rate, were finding great success with summer reading. 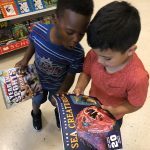 I learned about the BOGO (Buy One Get One) book fairs from Scholastic that you can bring to your school at the end of the year to help get more books in the hands of your kids. Then my wheels started spinning…. When I came back to my district after the training, I met with my Curriculum and Instruction team as they talked with me about Title 1 money that I had available. As we talked about campus needs, I shared with them the research that exists on providing students with access to books, putting books in their homes, summer reading, and more. Then I told them I had an idea. I wanted to use the Title 1 money to buy books. But of course, I wanted to go big and do it differently. And thankfully, they jumped on board. some money that they could spend on their students. 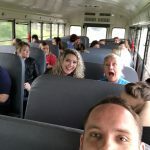 We had a work day coming up so I was going to rent buses and have us take a staff field trip! He was on board right away. His team came together (and were amazing btw) and allowed my team to go shopping. But my team didn’t just shop for random books. Before we went to the warehouse they sat down with every student to really learn their likes and dislikes. Their interests and their hobbies. Because my team was tasked with buying books individually for every child that fit them. Not just buying class sets of things. And we kept this trip a complete secret from the students. 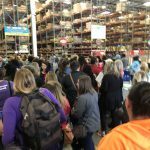 The day of the Warehouse shopping was magic. 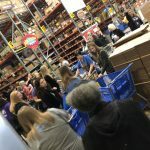 Teachers running from aisle to aisle to grab books. It was fantastic. 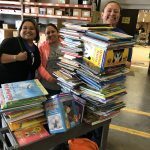 We filled an entire school bus full of books to bring back to campus. A week later, we revealed our trip to the students. 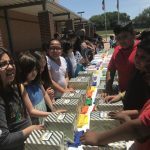 Teachers wrapped up books like Christmas Gifts and students came outside one grade level at a time, not knowing what was going on, only to find a gift with their name on it on a table. On the count of three everyone opened their gifts and squealed in amazement. We then told them that those were THEIR books to keep. It was a magical experience. 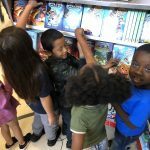 Parents were so caught off guarded that we even got several phone calls asking if they had to pay for the books or if it was real! ha! It was powerful too to hear from parent after parent of the excitement it built of reading in their homes, immediately. How parents couldn’t find their children because they were quietly reading in bed. 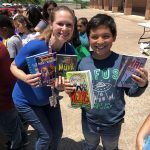 Or my favorite was the parent who said, “It was incredibly moving to me to watch my child, who hates reading because of his dyslexia, come home with a handful of books excited and asking if we could read them together.” Those are the moments we live for as educators. But it didn’t stop there…..I told you I had to do this big, and that wasn’t quite big enough for me just yet…. 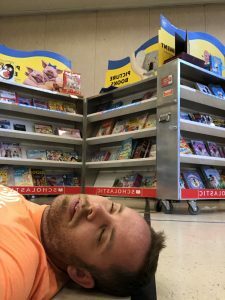 I then called up Mary Beth and Joe Shaw and told them I had another idea….I wanted to bring in the BOGO Book Fair to my school….but as a surprise. Why a surprise? Because we were going to give every student $100 to spend to buy whatever books they wanted. So with the BOGO deal it was like giving them $200! So we planned the BOGO fair for the last full week of school. 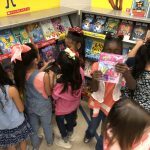 Now I don’t know if I mentioned this but we have about 775 students….so I really had to work hand in hand with Scholastic to plan this because this was a book fair unlike any they’d ever done. We were gonna be setting up a HUGE fair. After the fair was secretly set up in the Gym, we surprised the kids with the news. To hear the screams of excitement was so rewarding. We scheduled two classes every hour for a week. 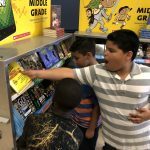 Working at a school were almost 90% of my students are on a free-and-reduced lunch, it was so heartwarming to watch them get to shop for any books they wanted! 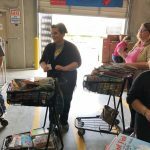 They were grabbing books left and right. No where did you hear the words, “I’m not a reader, I don’t want any of these books” or “I don’t like reading, this is boring”. There was running, laughing, and kids sitting reading everywhere. 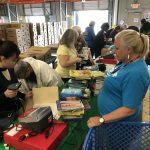 At the close of the book fair we ended up giving out around 13,000 books. 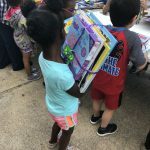 Those books went home with the students, many of which was their first ever book to have at home. What makes this even more sweet? 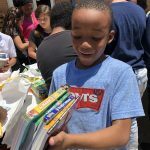 The last day of school a parent came up to me and said…”Thank you for giving my little boy (a 2nd grader), those books. He came home and was so excited that his 4 year old sister and his 15 year old brother have begged him to borrow the books. Now we read together as a family every night and we’ve never done that before. You helped bring us together.” Even as I type those words, tears are in my eyes. This undertaking was no small feat. And I can’t claim the credit, because a team of people helped make this happen. But I hope the ripples are felt for years to come, and I can’t wait to see the students in the fall and hear about their reading adventures that took place over this summer. 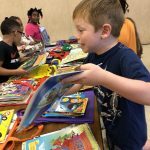 We believe in the depths of our hearts that putting books in the hands of kids can change a life. And not just any book, but a book they can call their own. A book they chose. A book that belongs to them. Reading changes lives. Books change lives.